Arbroath smokie - This is one of British cuisine's (or more precisely Scottish cuisine's) most famous dishes. It originates from Arbroath in Scotland, and is a lightly smoked haddock. Bouillabaisse - This fish stew is a popular dish in French cuisine, and originates from the city of Marseille. The stew is made from a variety of different fish and shellfish, to which are added celery, leeks, onions and tomatoes. The vegetables and fish are prepared separately, the cooked stewed vegetables being poured over French bread seasoned with bread crumbs, olive oil and chili peppers ("rouille"). 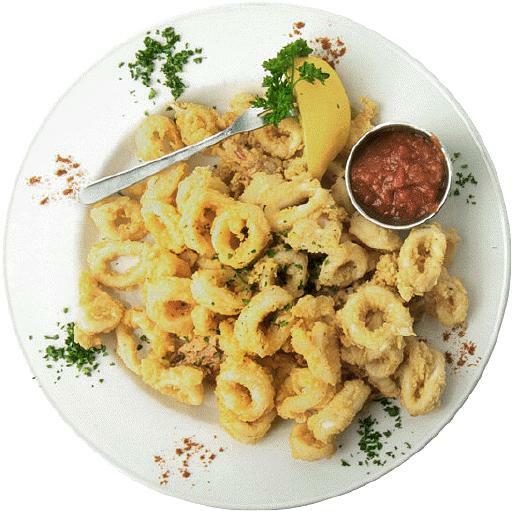 Calamari - Squid, usually cut into rings, and then deep-fried in batter. Caldeira - This a stew from Portuguese cuisine. It is made from fis (and sometimes shellfish), with onion, potato and tomatoes. Spices are also added, the exact choice depending on the region and chef, and may include allspice, cloves, curry powder, ginger, nutmeg, and saffron. Ceviche - This seafood salad is one of Peruvian cuisine's most famous dishes. It is made from raw fish with sliced onions, with lemon juice, lime or bitter orange (naranja agria). 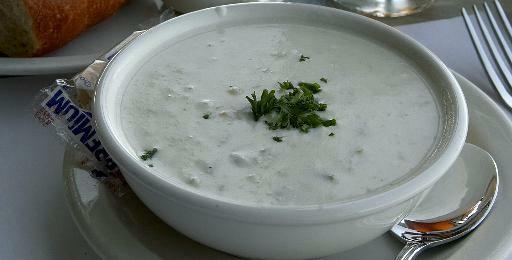 Clam chowder - This is a soup made from milk or cream, with clams, onions, potato, and sometimes bacon. Perhaps most famous version of the recipe is that from New England cuisine, which is known outside its home region as "New England clam chowder" or "Boston clam chowder". In New York city, a different version of the recipe is produced, which also has tomatoes added, and is known as "Manhattan clam chowder". Crab cakes - Patties made from crab meat and breadcrumbs, which are cooked by baking or frying. They are usually flavored with seasoning, sometimes herbs as well, and often a little Worcestershire sauce or mustard. There are many different variations on the basic recipe, and crab cakes are particularly popular in Southern cuisine ("Maryland crab cakes") and New England cuisine. Fish and chips - This is one of British cuisine's most famous dishes. It is made from by dipping cod or plaice in batter and then deep frying. The fish is served with thickly cut French fries ("chips"), with mushy peas (a paste made from mashing cooked green peas), and is traditionally flavored with salt and vinegar. Garlic Chilli Shrimp - Shrimp cooked with garlic and chilli. Hákal - This is a very famous dish from Icelandic cuisine, but it is not to everyone's taste. It is made from fermenting the meat of basking shark for several weeks, and has a strong ammonia smell. 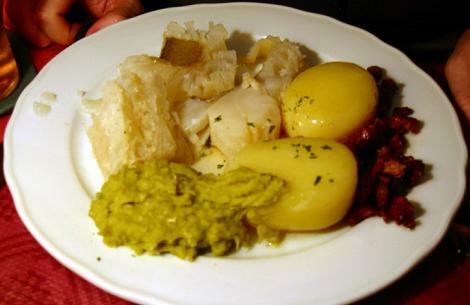 Lutfisk - This is a dish from Swedish cuisine. It contains stockfish (air-dried white fish), and is prepared using a very complicated process involving soda lye (a caustic soda solution). Paella - This rice dish from Valencia is one of Spanish cuisine's most famous recipe. Apart from rice, it contains rice, saffron and olive oil, and the dish is usually garnished with meat, seafood, and vegetables. Salt fish and ackee - This dish is a famous dish from Jamaican cuisine. It is considered one of island's national dishes, and is particularly popular as a breakfast. The salted cod is washed and rehydrated. Ackee, which is a type of fruit, is prepared separately by boiled - note: ackee must ripe, and carefully and properly prepared, as if this is not done correctly, it can be poisonous. Finally the cod and ackee and sautéed together with peppers, tomatoes, and spices. Sannakji - This is a famous dish from Korean cuisine. It is made from a live small octopus, cut in pieces, lightly seasoned and served. It should be so fresh, that the octopus pieces are still moving when served! 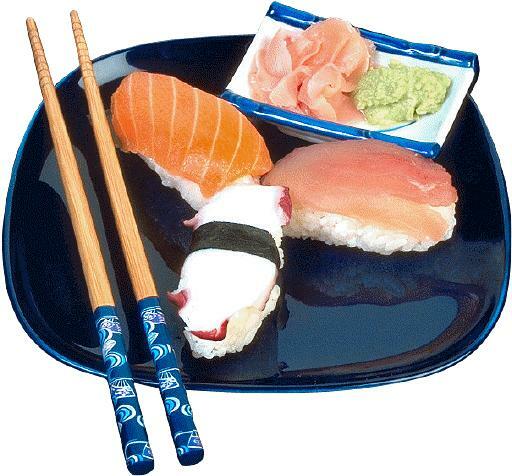 Sushi - This is one of Japanese cuisine's most famous dish. It is made from vinegared rice which can be topped with fish, seafood, meat or vegetables. Raw fish (sashimi) is sometimes used as the topping. Every few decades a chef or a teacher writes a cookbook that is so comprehensive and offers such depth of subject matter and cooking inspiration that it becomes a virtual bible for amateur and professional alike. Author James Peterson, who wrote the book Sauces, a James Beard Cookbook of the Year winner, and the incomparable Splendid Soups, once again demonstrates his connoisseurship with Fish & Shellfish, a monumental cookbook that will take its rightful place as the first and last word on seafood preparation and cooking. Fish & Shellfish demonstrates every conceivable method for preparing sumptuous meals of fish and shellfish, from baking, braising, deep-frying, grilling and broiling to poaching, panfrying, marinating, curing and smoking, steaming, and microwaving. Whether your taste runs strictly to shellfish or to everything seafood, Fish & Shellfish offers the equivalent of a complete cookbook on each subject. Within the chapters on finfish you'll learn how to prepare enticing recipes remarkable for their ease of preparation, their versatility, and their originality Here Peterson offers such splendid flavors and textures as succulent Stuffed Striped Bass with Spinach, Shrimp, and Mushrooms; crunchy Halibut Fillets with Curry, Herbs, and Almond Crust; delicate Salmon Fillets A la Nage with Julienned Vegetables; savory Braised Tuna with Vegetables; and fiery Thai-Style Swordfish Satay. If it's shellfish you prefer, there are pages and pages of recipes for baking, frying, steaming, or serving raw everything in a shell, including mussels, clams, oysters, scallops, lobster, shrimp, crab, and crayfish. Peterson explains how to judge freshness and how to prepare shellfish delights, including lemony-flavored Steamed Mussels with Thai Green Curry; aromatic Littleneck Clams in Black BeanScented Broth; a simple and comforting Linguine with Clam Sauce; elegant Hot Oysters with Leeks and White Wine Sauce; rich and savory Braised Scallops with Tomatoes and Fresh Basil; Steamed Lobster with Coconut Milk and Thai Spices; Shrimp with Tomato Sauce, Saffron Aioli, and Pesto; hit-the-spot Sautéed Crab Cakes; and Japanese Style Grilled Squid, to name but a few of the brilliant and vast array of wonderful seafood selections.Fish & Shellfishalso offers techniques for preparing raw, marinated, cured, and smoked fish. As you exploreFish & Shellfish, you'll learn not only the essentials of seafood preparation but everything in between, including how to make a curry sauce, which red wines to cook with, how to fry parsley, and how to make Vietnamese dipping sauces. You'll learn the secrets of a variety of coatings, how to blacken fish, add stuffings, and deglaze the pan for sauces, as well as discover the delights of salsas, chutneys, relishes, mayonnaises, and butters. Here is seafood in every incarnation, from soups, stews, and pastas to mousses, soufflés, and salads. Try everything from pureed Marseilles-Style Fish Soup and Moroccan Swordfish Tagine with Olives and Saffron to Homemade Cuttlefish-Ink Linguine, and Crayfish Stew with Tomatoes, Sorrel, and Vegetables. Jim Peterson has traveled the world and brought back the best international seafood flavors, textures, and techniques. Now you can improvise on your own with Thai marinades, Indian spices and condiments, and Japanese grilling methods, all of which play off more familiar ingredients to produce memorable dishes. At the end of Fish & Shellfish you'll find a complete Finfish Dictionary, where you'll learn all you need to know about more than sixty species of saltwater and freshwater fish. There's also a 32-page section of color photographs that pictures many of the mouthwatering recipes in the book. And the step-by-step pictorials in the color section will show you how to prepare fish and shellfish for cooking. James Peterson's books have been hailed as the most companionable and dependable of cooking guides. Replete with tables, timing charts, advice about equipment, safety preparations, a glossary of foreign ingredients, and an exhaustive index, Fish & Shellfish will give you the power of flexibility and spontaneity as it transforms you into an accomplished seafood cook. Here is a fundamental cookbook that you will come to depend on every time you think seafood-and now you'll be thinking seafood all the time. Savory crab cakes, panfried to a crisp golden brown. Succulent sea bass roasted on a bed of fennel. Tender lobster meat cloaked in drawn butter. When it comes to fish and shellfish, there is no end to the variety of dishes both flavorful and quick-cooking that can grace your table. In the pages of William-Sonoma Collection Seafood, you'll find more than 40 recipes for innovative appetizers and entrées as well as updated renditions of all the time-honored classics, from aromatic mussels marinière to hearty seafood paella. Whether you want to whip up a simple supper of Cajun-spiced catfish served with greens or present an elegant dish of lobster risotto drizzled with white truffle oil to hungry guests, here are ideas to suit every occasion. The recipes are accompanied with colorful photos and helpful sidebars on ingredients and cooking techniques, making each dish easy to envision and simple to prepare. A glossary and basics section round out everything you need to know to handle seafood with success, from skinning fillets and removing pin bones to testing for doneness. An essential addition to the kitchen bookshelf, Seafood will inspire the busy cook to prepare and enjoy a healthful and delicious fish or shellfish dish on any night of the week. Barton Seaver's second, seminal book on seafood cookery, after For Cod and Country (Sterling Epicure, 2011), offers more than 150 new mouthwatering recipes, including entrees, salads, appetizers, soups, pastas, stews, sides, and sauces. Try his Smoked Lobster and Fennel-Carrot Salad or Poached Salmon with Pickled Chilies and Mint and you'll understand what all the fuss is about. Each of Seaver's fresh-tasting, casual (and always delicious) recipes features seafood that hasn't been overfished or caught in an environmentally destructive way. This emphasis has made Seaver, already an acclaimed chef and restaurateur, one of the most important voices of the sustainability movement. The book is full of helpful advice on buying, choosing, and making the most of your ingredients, as well as an essential guide to seafood prep and cooking techniques--a must for all seafood lovers. With the growing trend to reintroduce US-caught seafood into our culinary lexicon, this trustworthy reference from prestigious writer, chef, and sustainability advocate Barton Seaver will be the go-to source for home cooks, culinary students, professional chefs, and anyone fascinated by American food culture. American Seafood looks at maritime history, including Native American fisheries; fishing technology (including aquaculture); the effect of imports on our diet, economy, and the health of our seas; the biology of taste; and the evolution of seafood cuisine, from Pine Bark Stew, red and white chowder, Po' Boys, and Clam Bakes, to Baltimore Crab Cakes, Planked Salmon, Oysters Rockefeller, and Sushi. 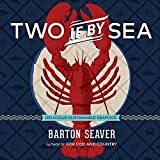 And although this is not a cookbook, Barton Seaver presents invaluable information on traditional culinary arts and his favorite ideas for taste pairings and preferred methods for cooking seafood. An index of species--with common, regional, and accepted names, all alphabetized--rounds out this must-have volume. In the south, we love fresh shrimp in all types of recipes. Some of the finest shrimp comes from the deep south. Shrimp is great for quick skillet meals, casseroles, salads, sandwiches, baked, grilled, broiled or fried. Included are 120 recipes using fresh shrimp. Shrimp appetizers are always the popular choice for parties. Shrimp is excellent for Po Boys, sandwiches and makes the perfect protein for light and easy main dish salads. 40+ Bariatric-Friendly Pressure Cooker Chicken, Beef, Pork, Fish and Seafood Recipes for Post-Weight Loss Surgery Diet! 1.) An at-a-glance nutrition summary table with cooking time to help you choose which dish to cook. 2.) 40+ low-carb, low-sugar, low-fat, high-protein bariatric-friendly Pressure Cooker Chicken, Beef, Pork, Fish and Seafood Recipes completed with serving information and nutritional information. All recipes in this book are bariatric-friendly with under 15g carbs, 5g sugar ,5g fat and over 10g protein per serving. Look at the list of recipes provided in this book below and see it for yourself. Grab this new cookbook today and discover how you can still enjoy your diet after weight loss surgery. Don’t take a pass on these wonderful recipes! Throughout, the recipes are supplemented with profiles of more than 30 of the top seafood markets?their histories, their owners, and their specialties?and sidebars that highlight the best of the area’s seaside culinary culture. Sicilians love seafood and seasonal produce. Sicilian Seafood is an intriguing compendium of 120 unusual traditional recipes for seafood and its accompaniments―including a great variety of first and second-course dishes, food for feasts, special sauces, delicious vegetables. A lively, authoritative book, it celebrates the great diversity of Sicilian food, which is intensely regional. The author takes readers on a culinary journey around Sicily, using seasonal produce and traditional cooking methods and techniques, layered with fascinating information about the origins of recipes and information about sustainability issues. An illustrated guide to the world's fish and shellfish followed by hundreds of appetizing recipes.